The addition of the third dimension makes the acoustic impression even clearer and more vivid. This rich audio experience redefines the benchmark for in-car listening pleasure. For many years, the brand with the four rings has been renowned for establishing new milestones in sound quality time and time again. The latest technology, 3D sound, will be making its debut in the Audi Q7* in 2015. It is available as a component of the Advanced Sound System from Bang & Olufsen and also of Bose Surround Sound. At its core is a complex algorithm that calculates the control signals for each speaker swiftly and precisely. Audi developed it for the Bang & Olufsen system in partnership with the Fraunhofer Institute for Integrated Circuits in Erlangen. In the first stage of the process, the software breaks the data for the music source down into its spatial components. It does this by using the spatial information contained in the data. For example, when an artist is singing from a stage, the floor, ceiling and walls of the concert hall reflect the sound with different time lapses. It bounces off the floor in just a few milliseconds, while it is only reflected by a wall 40 meters (131.2 ft) away after more than 200 milliseconds. Using these different sonic reflections, the algorithm is able to calculate a mathematical model of any recording room. It is irrelevant whether the audio signal is recorded in mono, stereo or 5.1 Surround Sound. The data format of the music and its source – such as online streaming, VHF radio or CD – is equally irrelevant. The second stage of the process involves reassembling the sound portions so that the sound pattern inside the car corresponds to the original recording room. This calls for intensive calculations. 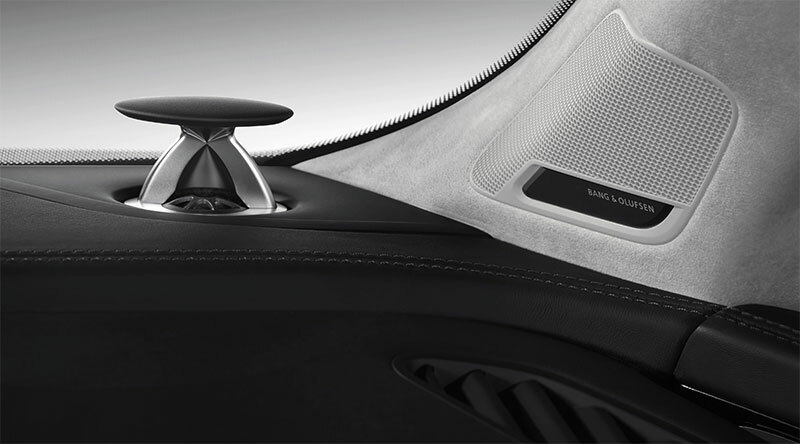 In the Bang & Olufsen Advanced Sound System, the digital signal processor energizes 11 channels with a total of 23 speakers in such a way that the sound is equally precise and harmonious in every seat. Four speakers installed in the A‑posts and each supplied along their own channels broadcast the portions that generate the spatial height. Newly developed speakers such as a subwoofer enlarged from 200 millimeters (7.9 in) to 250 millimeters (9.8 in) and a new amplifier now with an output of 1,920 watts guarantee listening enjoyment of the very highest caliber. The Bose Surround Sound system, which generates the surround sound with 20 speakers, also features four speakers located higher up to generate the third dimension. With 3D sound, Audi keeps up its tradition of breaking new ground in the hi‑fi sector. 2005 saw the advent of high‑end sound in the Audi A8* with the Bang & Olufsen Advanced Sound System. The Danish hi‑fi specialist’s premium sound reached the compact category in 2012, when it first featured in the third‑generation Audi A3*. The new Audi TT* took a major step towards 3D sound in 2014 with the adoption of Symphoria technology, software again developed in partnership with the Fraunhofer Institute for the processing and reproduction of audio signals.